At the weekend I packed my lovely little rucksack and drove for over 3 hours to attend a luxurious night at Clevedon Hall in North Somerset. Despite hating driving (especially for more than an hour!) I bit the bullet and accepted my invite, because after checking out the website (which you can see for yourself here), I simply couldn’t pass up on the opportunity to experience some of those fantastic looking rooms for myself! Predominantly used as a Wedding venue, Clevedon Hall is a place packed full of history. In it’s quaint countryside setting close to the sea, the location itself it impressive within itself. Built for a bloke called Conrad Finzel in the 19th century, he arrived as a ‘German émigré’ to avoid conscription into the army. He soon built up the UK’s largest sugar-refining business based in Bristol – So there’s a little history lesson for you…. Now on to the snazzy stuff. As we didn’t get to Clevedon Hall until around 5pm, there wasn’t too much time to explore the local area (we did explore Bristol on our way down though!). After being welcomed and settling in to our room, having a chance to freshen up, we got ready and headed downstairs to the ‘Great Hall’ (please excuse my lack of pictures! I forgot my memory card for my camera, bought one, then my battery died shortly after taking the room snaps eep!). Whilst in the great hall, we enjoyed canapés and prosecco until our hearts (and bellies) were almost content. We didn’t want to fill up too much before our main meal at 8pm. During this time we got to explore even more rooms, and learnt more about the history of the hall and local town. Going through stages of residential and institutional use, Clevedon Hall is as impressive in background as it is in aesthetics and set to grow even more impressive with the renovation of more rooms being specially designed for the building. A mixture of modern chic with flea market finds ensures that the interior design is as rich as the place itself and each suite is decorated with an individual theme. For me, the finishing touches in the room really made you feel like the stay was an experience, rather than just another night away from home. The little bits and bobs which completed each suite made sure that the theme was consistent throughout – even down to the books for decorative purposes which were scattered around in stacks! So, this is where the pictures become a little less impressive quality wise, as I was using my phone camera. This doesn’t detract from the appearance of the canapés at least though! We enjoyed these outside, as the sun was still shining and we were all having a little mingle. 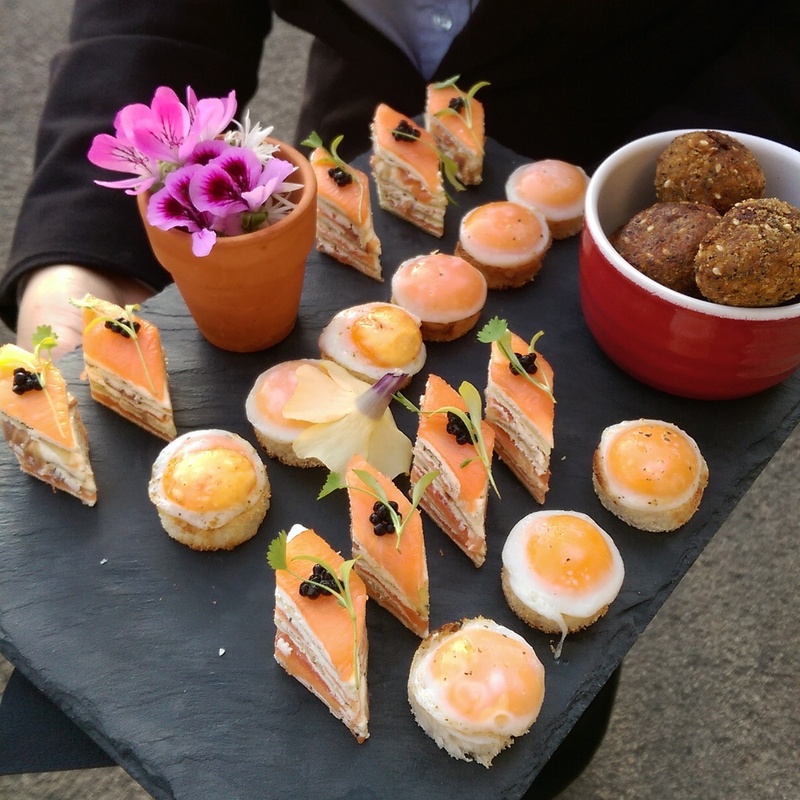 The lovely little treats below are: Smoked salmon mille-feuille, truffled quail eggs and duck hoisin beignets. The duck option was my favourite, as the warm gooey inside was a delicious contrast against the crunch of the outside. Yum. 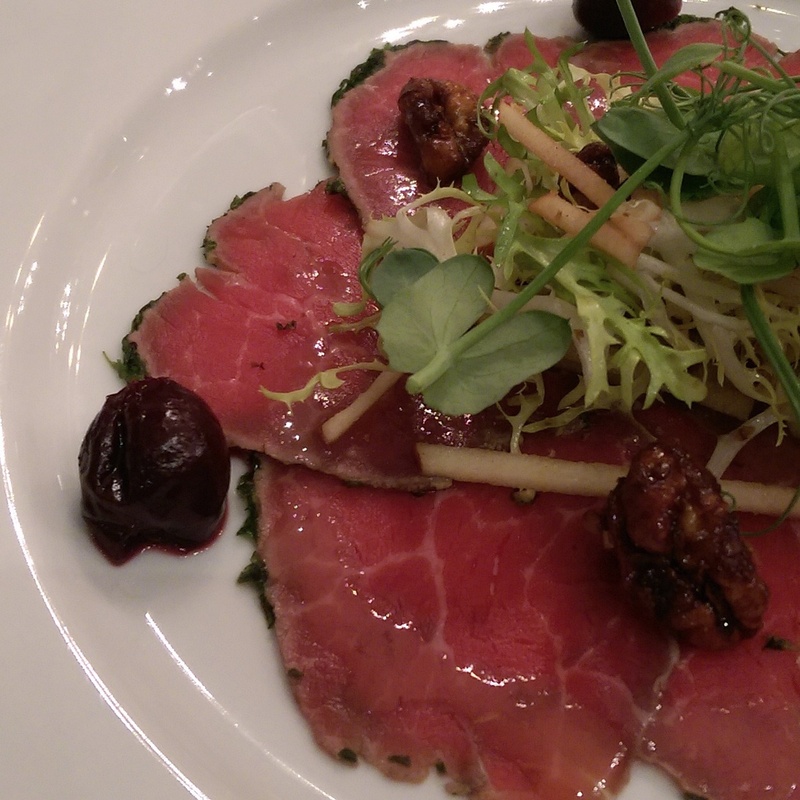 The starter was carpaccio of beef with poached cherries, candied walnuts and an apple salad. This was once again, a dish full of excellent contrasting flavours. The beef was so finely sliced and literally melted on your tongue whilst the cherries and candied walnuts added a nice sweetness. 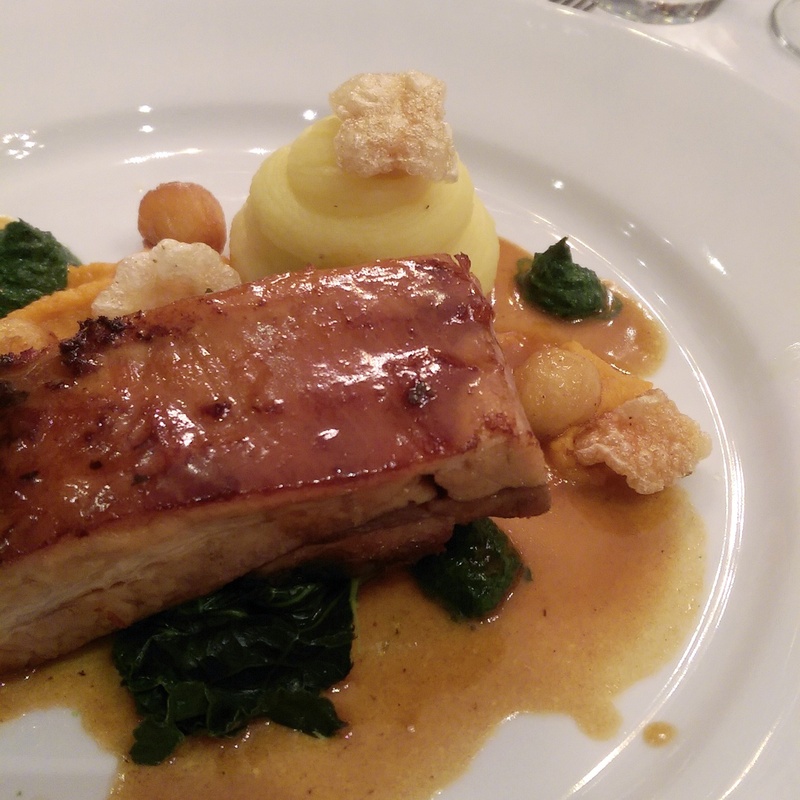 For main we were served slow cooked belly of pork with caramelised apples and pork popcorn, with wild garlic puree, creamed potatoes and a spiced jus. When I first saw this dish, the Stokie in me did think ‘bloody hell, is this it? !’ and initially thought it was a really small portion. But once you got stuck it, it was *just* more than the right amount for me. The pork was a generous size once you pulled away the tender meat (that’s what she said. I CAN’T RESIST, OKAY!) and it was complimented extremely well with the rest of the masterchef-esque elements on the plate. 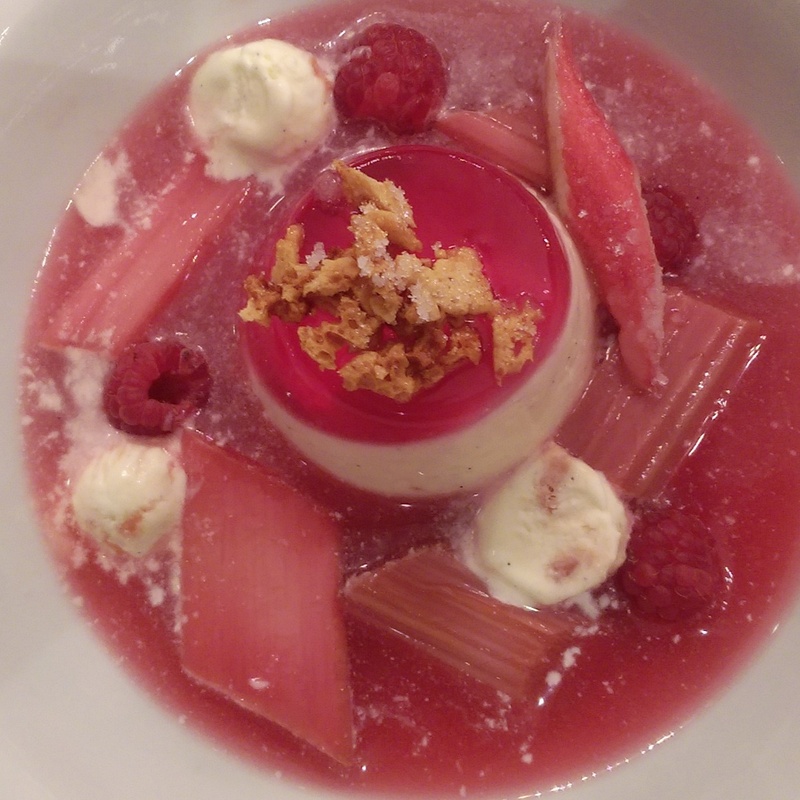 Finally, for dessert we enjoyed a vanilla set cream with raspberry jelly alongside poached rhubarb in a champagne chilled soup. Well, I’ve never had a champagne chilled soup before… This was an interesting one and the slight tingle left in the bubbly some how made the sharpness of the rhubarb stand out more, but that was complimented by the creaminess of the set vanilla. A little more filling than I expected, buy excellent all the same! I did post some more images over on my Instagram, so if you fancy having a little gander head over there and take a look. You can find out more about Clevedon Hall and it’s wedding services by checking out their website here.